Place Your Holiday Catalog Orders NOW! You can begin placing your orders now here. This catalog is chock full of SO MANY inspiring products, from stamp sets, to framelit dies, to paper, and ribbon and embellishments and punches to send a stamper into a stamping frenzy! Seriously, the intricacy of the framelit dies is incredible, allowing you to create things from paper that weren’t possible a few years ago. Whether Christmas or Halloween, Autumn or Winter; we’ve got you covered! Which bundle is your #1 must-have? Do you want them all? 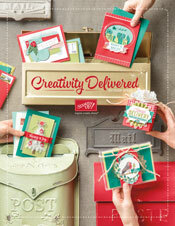 I’m so excited to share the Holiday Catalog with you! I hope you are as excited as I am. I will be sharing some of the projects I’ve been making on my blog in the coming days, and on my Facebook page. Make sure that you like me on Facebook and follow me on Pinterest too! Sign up for my mailing list (click on the form to the right). You will need to be on my mailing list to receive my 12 Weeks of Christmas newsletter, a new project each week to get you in the Holiday Crafting Spirit!